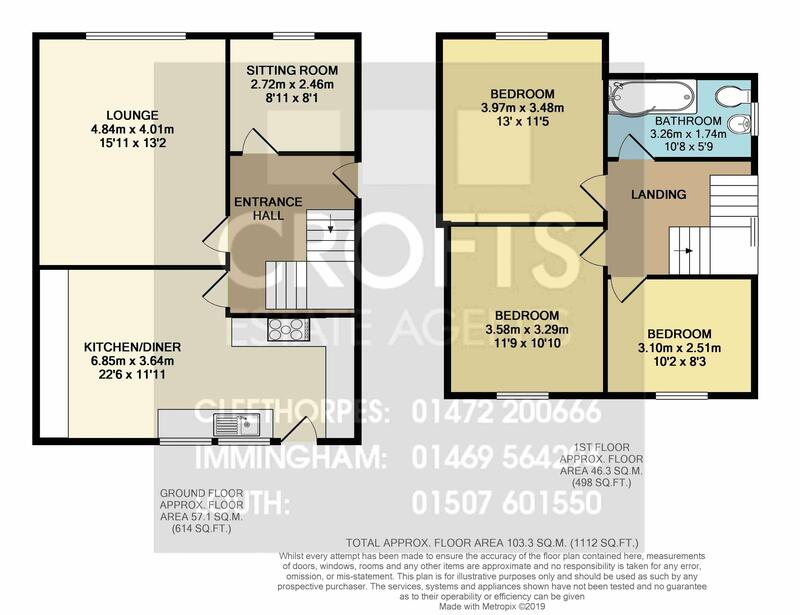 Crofts estate agents are delighted to offer for sale this spacious semi detached property which is located within the popular port town of Immingham. Ideally suited to a young family, this property offers plenty of space to relax and entertain. Nearby there are a wide variety of local amenities, schools and excellent road links. Internal viewing will reveal the entrance hall, lounge, sitting room and kitchen-diner. To the first floor there are three bedrooms and the bathroom. Externally there are gardens, off road parking and the garage. The property also benefits from uPVC double glazing and gas central heating. Entering the property through the front door reveals a large space with coving to the ceiling, a radiator and carpeted floor. The lounge has a window to the front elevation, coving to the ceiling, a radiator and carpeted floor. There is also gas fire within a feature surround. The sitting room has a window to the front elevation, coving to the ceiling, a radiator and carpeted floor. The kitchen-diner has a window to the side elevation, two to the rear and a door to the rear elevation. There is also coving to the ceiling, a radiator and vinyl flooring. With plenty of counter space and a range of fitted units to base and eye level with a sink and drainer, plumbing for a washing machine and complimentary splash back. Lastly there is a FIVE ring gas hob with extractor over, electric oven and a large space for a table and chairs. The first floor landing has a window to the side elevation, access to the loft, coving to the ceiling and a carpeted floor. Bedroom one has a window to the front elevation, coving to the ceiling, a radiator and carpeted floor. Bedroom two has a window to the rear elevation, coving to the ceiling, a radiator and carpeted floor. Bedroom three has a window to the rear elevation, coving to the ceiling, a radiator and carpeted floor. The bathroom has an opaque window to the side elevation, partial wall boarding, a radiator and vinyl flooring. There is also a vanity basin, WC and P shaped bath with glass screen and mains operated shower. The garage has an up and over door, window to the side elevation, door to the rear elevation and light and power. There are gardens to front and rear with lawns to both. There is off road parking and perimeter hedges. There is also a patio area to the rear garden.